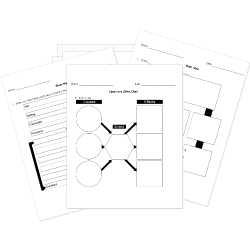 You can create printable tests and worksheets from these Grade 7 Character Study questions! Select one or more questions using the checkboxes above each question. Then click the add selected questions to a test button before moving to another page. When Kaitlin got to Patrick's apartment, she took a look around and saw several half-filled cans of soda and some cooked chicken breasts that had gone bad in a pan in the kitchen. She also noticed that all of the lights and televisions were on and that Patrick wasn't home. What character trait does Patrick exhibit? Determine whether the following is an example of direct or indirect characterization. Today was Kiki's first day at high school. Upon arriving she was both impressed and overwhelmed by the size of the building. As she passed by the fire alarm, one of the seniors struck up a conversation with her. "Did you know that we are supposed to have a fire drill today?" Kiki said that she did not know that. The senior then convinced her that the principal is probably running behind and would give her fitting reward if she pulled the fire alarm for him. Wanting to make a good impression on the older students and the principal, Kiki pulled the fire alarm. She was suspended for a week. What character trait does Kiki exhibit? "They're just parts of a large, dirty organism, like that alien monster thing in that Star Trek movie--unthinking, but very, very dangerous. The character who opposes the protagonist is the . The antagonist opposes the protagonist. Which choice describes a dynamic character? This character provides a contrast to the main character. Which word best describes Michael Jordan after he was cut from the basketball team during his sophomore year? Determine whether the following passage is an example of direct or indirect characterization: "Johnny was hurt because his parents didn't want him to play football." Main person or persons in a story. Which word best describes Michael Jordan's basketball skills when he first started playing?